When hosting an event, one of the most important aspects to consider is the food spread. This is particularly true when you are hosting an event with dozens — or even hundreds — of people in attendance. Those people are going to have a wide range of pallets, tastes, and of course dietary restrictions. How can you, as the event organizer and/or host, be certain that you are going to please everyone? While that may not always be possible, you can at least give it your best shot. When it comes to providing breakfast, lunch, or even dinner to the guests at your next event, one thing you want to keep in mind is the gluten-free crowd. What are some viable gluten-free catering ideas? Keep reading to find out and contact Etai’s — the very best in fresh and gluten-free catering in Denver — today. When searching for the best catering services for your event, you want to be sure that you are choosing a company with a solid reputation and a number of tasty food options. At Etai’s Catering, we pride ourselves on serving up fresh, healthy, and downright tasty catering options to our neighbors in Denver. Whether it’s box lunches for a corporate event, or it’s a quick and easy breakfast spread for a Monday morning office meeting, we have you covered with our Denver catering services. We hand-craft our entire menu here in our Denver kitchen — and best of all, we have a number of vegetarian and gluten-free options available! 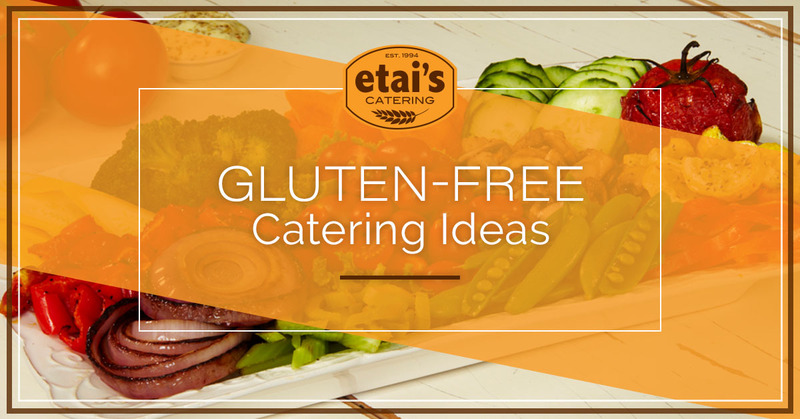 When searching for gluten-free catering ideas, look no further than Etai’s Catering. Here are some of the delicious gluten-free options we have available. Whether it’s a funeral or a business lunch, Etai’s Catering has you covered with gluten-free catering that everyone can enjoy. From salads to sandwiches, we offer the very best in fresh, healthy catering to our friends and neighbors in Denver. With help from our legendary Izzio’s Bakery, we are able to provide gluten-free sandwiches that don’t sacrifice quality or taste, along with fresh “Super Food” salads that are packed with nutrients. Turkey Avocado: Features roasted turkey, avocado, sliced tomato, leaf lettuce and aioli on soft, gluten-free bread. Spicy Italian: Includes salami, soppressate, capicola, provolone, giardiniera, romaine lettuce, light mayo, and a gluten-free hoagie. Etai’s Veggie: Gluten-free and vegetarian approved, this sandwich features sliced tomato, grated carrot, red onion, cucumber, arugula, sprouts, Dutch edam cheese, and a horseradish dijon. Roasted Salmon Salad: Features roasted herb-marinated salmon, shredded carrots, and mixed spring greens along with our own mango salsa and orange balsamic dressing. Mixed Avocado Garden Salad: Fresh avocado, crisp cucumber, shredded carrot, raisins, and mixed spring greens drizzled with Italian vinaigrette. Sunshine Salad: Another vegetarian option, this salad features red cabbage, shredded carrots, green onions, parsley, and an apple cider lemon vinaigrette. Browse our Denver catering menu to see more of our gluten-free options and order from Etai’s for the very best in fresh, healthy Denver catering services today.